Tom Clancy games are known for their realism, but all of that has taken off and flown out the window in HAWX. Planes carry hundreds of missiles, handle almost like cars in a street racing game, and can withstand multiple missile hits. The game's storyline stretches plausibility to just past its breaking point with a rogue security firm ala Blackwater selling the services of its extensive private military to rogue states with interests that come into direct conflict with those of the US. Even the game's title is a misnomer. HAWX stands for High Altitude Warfare – Experimental, but you fly aircraft from the standard arsenals of the world's militaries of the past forty years, and just about all the action takes place under 10,000 feet. However, if you can put all that to the side and just go with it, you'll find that HAWX is quite enjoyable. It may not be a true flight sim, but it is a pretty enjoyable action shooter. It's hard to write about HAWX without first mentioning the graphics, which are simply gorgeous. 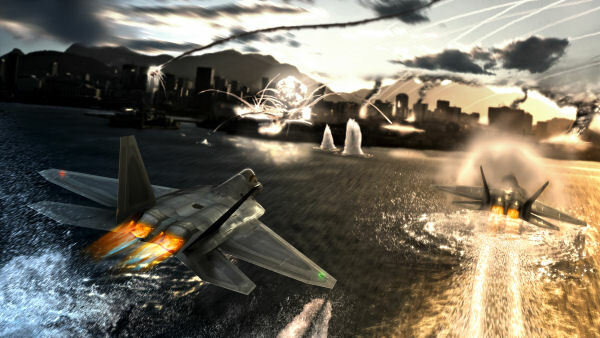 HAWX has to be the best looking flight combat game ever to appear on a console. The battles take place over photo-realistic terrain created from satellite imagery that ranges from tropical island chains to barren desert and includes some famous cities as well. The aircraft themselves look fantastic, and even though you can play the game with a chase cam, HUD view, or cockpit view, you'll simply leave the game in the chase cam view so you can admire your aircraft while playing. Each aircraft in the game is highly detailed and in flight you'll see all the flaps working, condensation trails form, and your missiles separate from the airframe and go streaking towards your targets. There's more than enough here to satisfy the fighter plane geek in you – as long as that geek isn't too hung up on flight models, that is. HAWX emphasizes action over realism, forgoing complicated controls and the realities of the physics of flight in favor of shooter action where blowing things up is more of a focus than keeping yourself airborne. Planes fly at a constant throttle, and the triggers are used to slow down to a lower speed or to kick in an afterburner to increase speed. The bumpers are used for the rudder, giving you a little yaw control that is useful when lining up a target or tightening up a turn. These controls and the left stick are all you need to fly your plane. You don't have to worry about stalls and there are no takeoffs and landings in the game, so all that you really need to watch for is smacking yourself into the ground. You can double-tap a trigger to enter a flight mode without all of the flight stability assistance, which adds a dash of additional realism that is countered by more fantasy flying. This mode allows you to perform more advanced maneuvers that amount to aerial power slides, but also throws in the threat of stalling. Power slide for too long and you will stall, but it's pretty easy to pull out of it if you do. This mode is useful for dodging a missile or trying to turn inside on an enemy, but when you're in this mode the camera is placed at a good distance from your plane and off to the side. It's hard to fly for long in this mode because it's difficult to line up your targets or even to quite figure out which direction that you're flying in.